The Board of Mary Potter Hospice is pleased to appoint two new Trustees, adding diversity and skills to the current Board to help the Hospice respond to the needs of the Wellington community into the future, says Mary Potter Hospice Chair Mark Cassidy. Sumati Govind is an experienced business and investment executive, with governance experience in the not-for-profit and business sector. 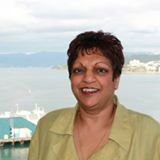 She is a member of the Wellington Indian Association and a born and bred Wellingtonian. Sumati has strong connections to Ngati Tu Korehe, Te Ati Awa, Ngati Toa, Ngati Raukawa and Te Arawa. Tui Te Hau is the Director of Public Engagement at the National Library of New Zealand and formerly established Mahuki, Te Papa’s innovation hub. In her work, Tui has sought opportunities to deliver greater value for communities, whanau, hapu and iwi. Tui is an experienced leader, a scholarship recipient for the 2017 Global Women Breakthrough Leaders Program and finalist in the government category for the Wellingtonian of the Year 2017. “I’m very pleased that Sumati and Tui are joining the Board of Mary Potter Hospice. They both have strong governance, business and stakeholder experience, which is so important for an organisation that is as complex as the Hospice,” Says Mr Cassidy.